Vijay R. Pandharipande, Donald B. and Elizabeth M. Willett Professor in Physics, died on January 3, 2006, in Boston, Massachusetts, after a long battle with cancer. A memorial service was held at the Beckman Institute in Urbana on January 15. Professor Pandharipande was born on August 7, 1940, in Nagpur, India, the son of Raghunath and Kamal Pandharipande (née Brahma). He married Rajeshwari Sinha in 1966; she survives. Also surviving are his son Rahul Pandharipande of Princeton, New Jersey, daughter Pari Pandharipande of Boston, Massachusetts, grandson Dhruva Schlondorff of Boston, Massachusetts, and his sister Kalpana White of Waltham, Massachusetts. He was preceded in death by his parents and his brother. Professor Pandharipande studied at the College of Science, Nagpur, India, and received a bachelor of science degree in physics, mathematics, and applied mathematics, and a master of science degree in physics from Nagpur University, Nagpur, India, in 1959 and 1961 respectively. Upon graduation, he joined the Tata Institute of Fundamental Research, Bombay, India, where he simultaneously began work towards a doctorate in physics, which was awarded by the University of Bombay in 1969. After postdoctoral fellowships at the Niels Bohr Institute, Copenhagen, and Cornell University, he came to the Department of Physics at the University of Illinois as a research associate in 1972 and was appointed to the faculty as an assistant professor in 1973. He was promoted to associate professor in 1974 and to full professor in 1977. A member of the board of directors of the European Center for Theoretical Nuclear Physics, Professor Pandharipande also held a visiting faculty appointment at Argonne National Laboratory from 1983 until his death. An internationally recognized nuclear theorist, Professor Pandharipande played a leading role in the development of the nuclear many-body problem. His contributions led to a state-of-the-art comprehensive, quantitative, and reliable theory of nuclei, neutron matter, and neutron stars, and were extended more generally to quantum liquids. His theoretical contributions set the agenda for experimental work, significantly advancing the use of electron scattering as a probe of nuclear structure. Working with his graduate students and collaborators, he initiated and carried out over several decades a successful research program to describe all nuclear systems in terms of the elementary two- and three-body interactions of the constituent nucleons. His pioneering variational Monte Carlo calculations have become the standard methods for the field. In addition to his nuclear studies, Professor Pandharipande applied his expertise to condensed matter physics, where his research included Bose and Fermi helium liquids and drops, including structure, response, and elementary excitations. Most notably, he predicted structures subsequently observed in the dynamic response of Bose superfluid helium and demonstrated the important effects of the enhancement of the effective mass at the Fermi surface of Fermi liquid helium. Professor Pandharipande was a life member of the Indian Physical Society, a Fellow of the American Physical Society, and a permanent member of the University of Illinois’ Center for Advanced Study. He served as a member of the editorial board of Physical Review C, American Physical Society, 1991–1994, and a member of the editorial board of the Journal of Physics G: Nuclear and Particle Physics, Institute of Physics (UK). He also served as an editor for Nuclear Physics and Computer Physics Communications, North Holland. 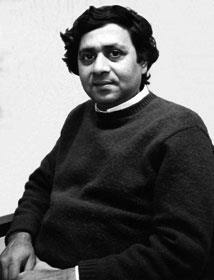 In recognition of his fundamental contributions to determining the structure of light nuclei by solving the Schrödinger problem with more than three nucleons using realistic nucleon-nucleon interactions supplemented by three-body forces, Professor Pandharipande was awarded the prestigious Tom W. Bonner prize of the American Physical Society in 1999. A memorial symposium celebrating Professor Pandharipande's life and science was held in Urbana on September 29 and 30, 2006.